This intensive formula is designed to deeply moisturize the hair and scalp while effortlessly enhancing body and shine. Made with the finest selection of thoughtfully chosen ingredients, including Biotin, Saw Palmetto, Tee Tree and Jojoba Oils, Regenepure Intense Volumizing Conditioner will keep you hair silky smooth while providing it with the bounce and thickness it needs. 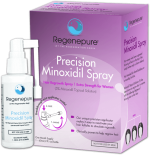 For best results use with other Regenepure products.